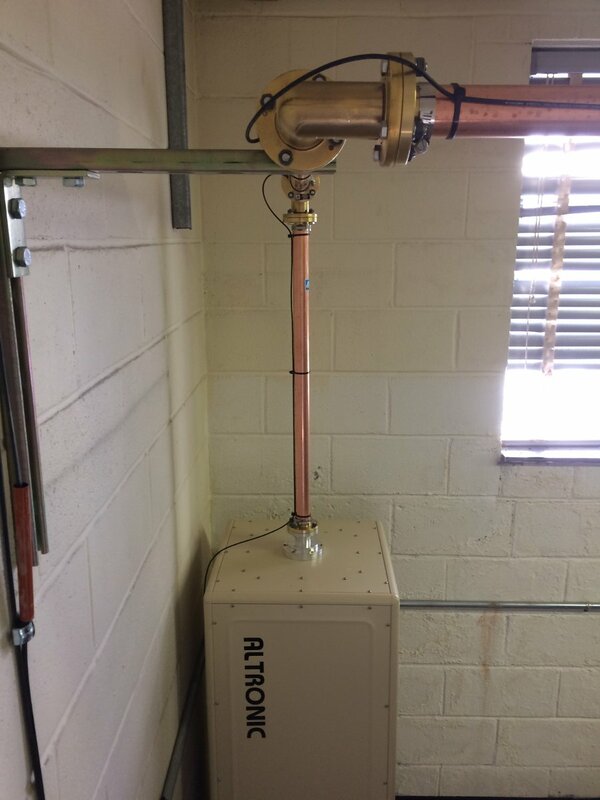 Installing transmitters requires a multitude of skills; understanding the electrical code, basic wiring, RF theory and even aesthetics play some part in a good installation. Working with rigid transmission line is a bit like working with plumbing (and is often called that). Rigid transmission line is often used within the transmitter plant to connect to a four port coax switch, test load, backup transmitter and so on. Sometimes it is used outside to go up the tower to the antenna, however, such use has been mostly supplanted by Heliax type flexible coax. 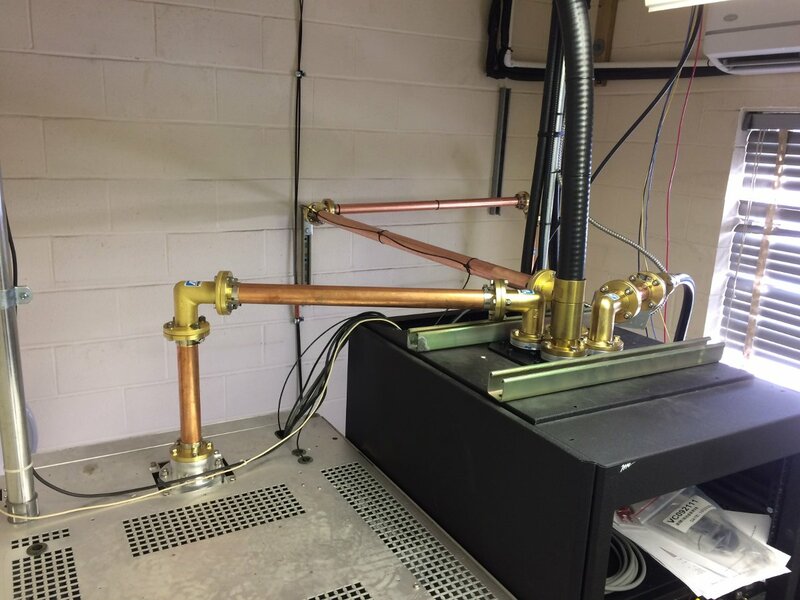 We completed a moderate upgrade to a station in Albany; installing a coax switch, test load and backup transmitter. I thought it would be interesting to document the rigid line work required to complete this installation. The TPO at this installation is about 5.5 KW including the HD carriers. The backup transmitter is a Nautel VS-1, analog only. This site uses 1 5/8 inch transmission line. That line is good for most installation up to about 10-15 Kilowatts TPO. Beyond that, 3 inch line should be used for TPO’s up to about 30 Kilowatts or so. Even though the transmission lines themselves are rated to handle much more power, often times reflected power will create nodes along the line where the forward power and reflected power are in phase. This can create hot spots and if the reflected power gets high enough, flash overs. 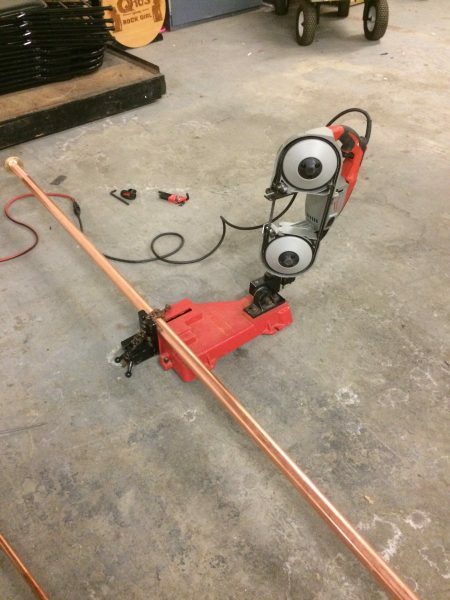 Working with rigid line requires a little bit of patience, careful measurements and some special tools. Since the line itself is expensive and the transmission line lengthener has yet to be invented, I tend to use the “measure twice and cut once” methodology. For cutting, I have this nice portable band saw and table. This particular tool has saved me hours if not days of work at various sites. I have used it to cut not just coaxial line and cables, but unistrut, threaded rod, copper pipe, coolant line, conduit, wire trays, etc. 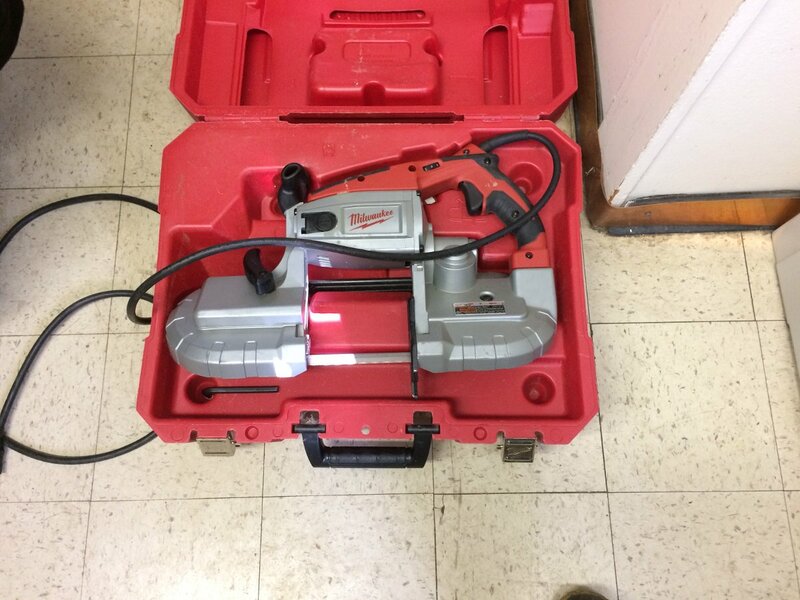 If you are doing any type of metal work that involves cutting, this tool is highly recommended. Next point is how long to cut the line pieces and still accommodate field flanges and inter-bay line anchors (AKA bullets)? The inner conductor is always going to be sorter than the outer conductor by some amount. 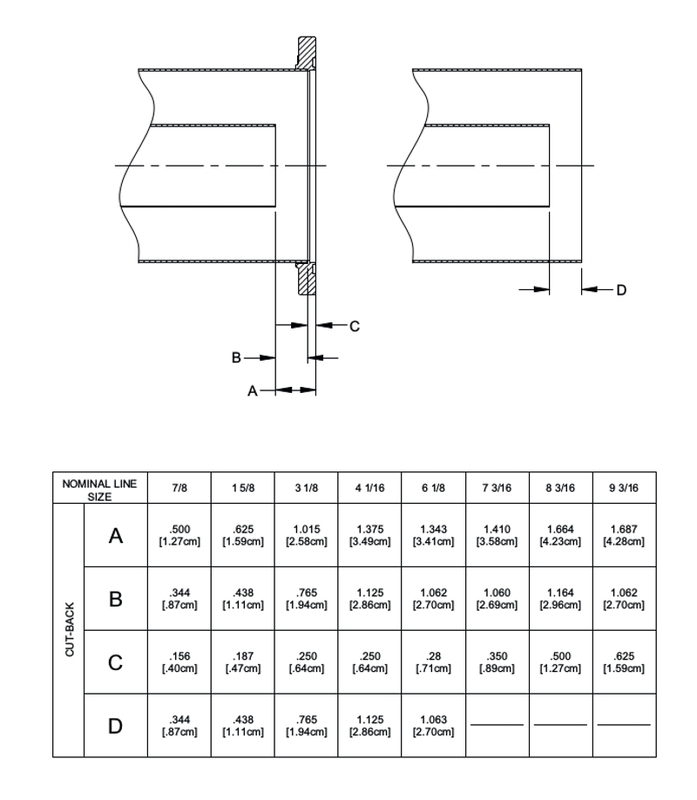 Below is a chart with the dimensions of various types of rigid coaxial cables. When working with 1 5/8 inch rigid coax, for example, the outer conductor is cut 0.187 inches (0.47 cm) shorter than measured distance to accommodate the field flange. 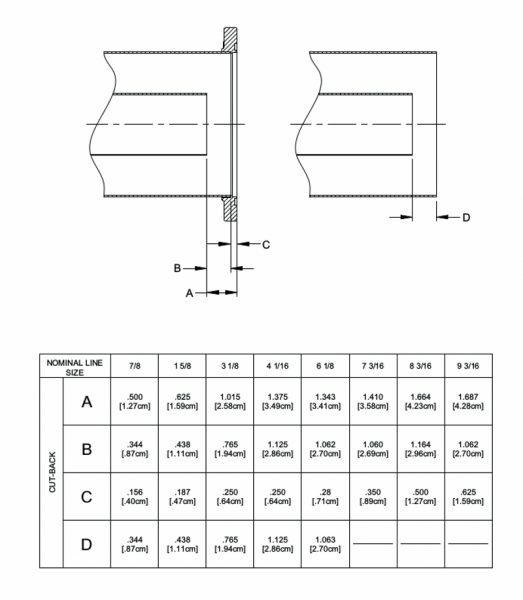 The inner conductor is cut 0.438 inches (1.11 cm) shorter (dimension “D” in the above diagram) than the outer conductor to accommodate the inter bay anchors. These are per side, so the inner conductor will actually be 0.876 inches (2.22 cm) shorter than the outer conductor. Incidentally, I find it is easier to work in metric as it is much easier to measure out 2.22 CM than to try and convert 0.876 inches to some fraction commonly found on a tape measure. For this reason, I always have a metric ruler in my tool kit. The next step is de-burring. This is really critical at high power levels. 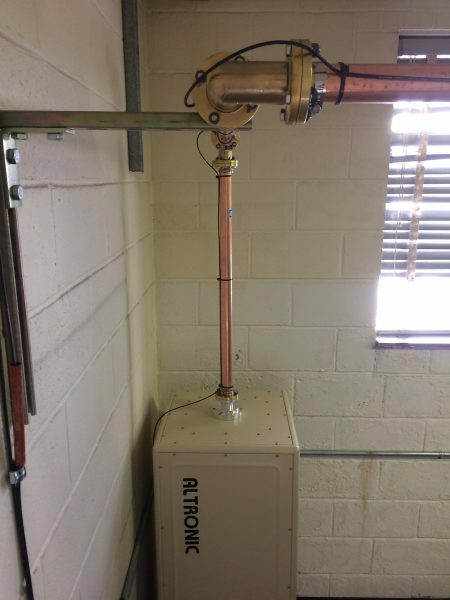 I use a copper de-burring tool commonly used by plumbers and electricians. One could also use a round or rat tail file to de-bur. The grace of clamp on field flanges is they have some small amount of play in how far onto the rigid line they are clamped. This can be used to offset any small measurement errors and make the installation look good. Working with RF can produce some head scratchers. Most transmitter manufactures tend to use the same type of connector for things like exciter RF outputs and composite inputs. 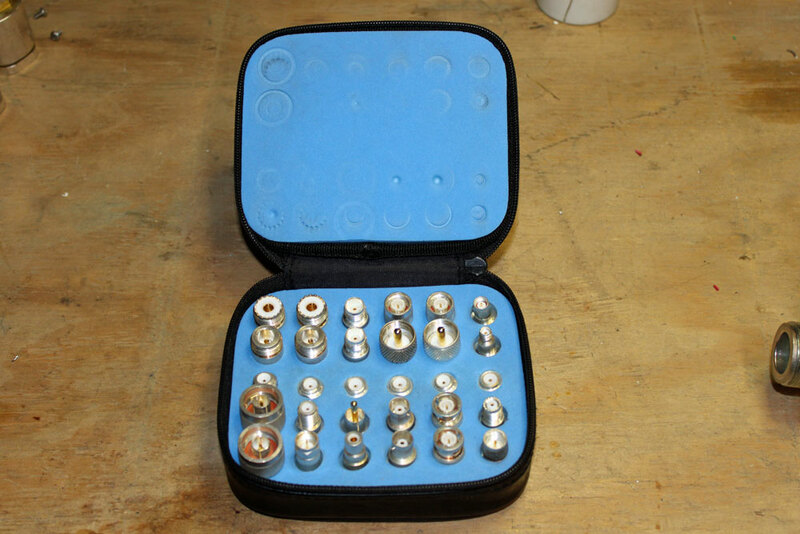 Over the years, I have become well stocked with all sorts of BNC and Type N connectors. Satellite equipment uses Type F connectors, Analyzers use Type N, Oscilloscope uses BNC, GPS equipment uses SMA and so on. Except when they don’t. As any good engineer will tell you, when they don’t will be in the middle of the night at some mountain top location while the station is off the air. After one such incident, I invested in a TPI-3000A adaptor kit. This kit has both the male and female versions of Type N, F, SMA, BNC, TNC, UHF, UHF mini and RCA. They can be mated in any combination using the Universal interface. 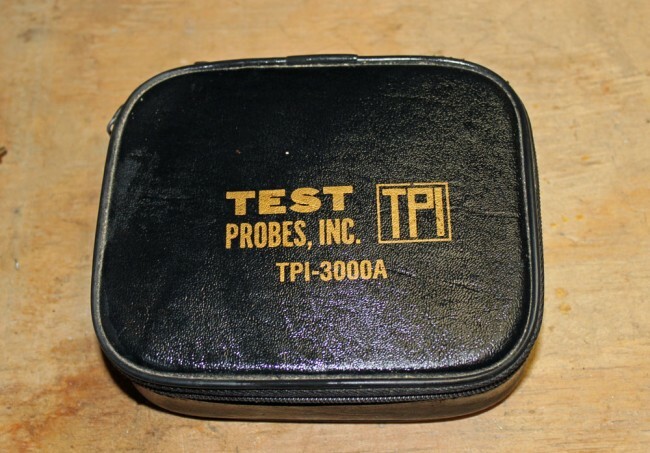 On more than one occasion, this little kit has meant the difference of between being back on the air or driving down the mountain to look for an in between series adaptor. A couple of recommended additions include a 7/8″ and 1 5/8″ EIA flange to type N male. They can be a little pricey, however, I have seen several for sale on eBay for less than $100.00. The key to not loosing the various little parts to this kit is to write a little note detailing the date and location where the adaptor was used, then stuff it in the empty hole. Hopefully, when permanent repairs are made, the adaptor will be retrieved.